← CraneFest – Conserving our Sandhill Cranes! 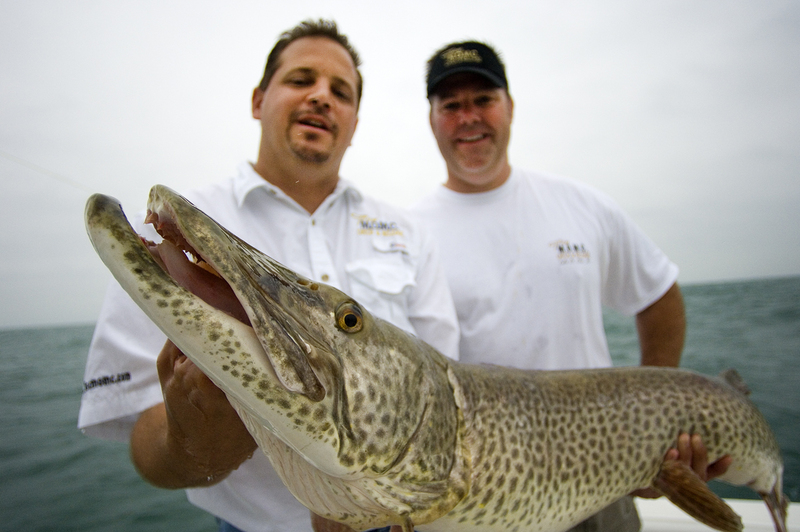 Anglers are going to see a new apex-predator swimming in certain western and northern Michigan waters in future years. The DNR is continuing to expand its Great Lakes muskie program. I suspect an increasing number of anglers will be rising to the bait. You may recall that the DNR switched to raising Great Lake muskies exclusively in 2010 when the state launched its Great Lakes muskellunge program after decades of stocking northern muskies, a strain native to parts of Michigan’s Upper Peninsula. Fisheries officials and representatives from groups like the Michigan Muskie Alliance have said the Great Lakes strain is preferable because it is indigenous to more waters and can be stocked in more places. The first crop of those fish was distributed in 2012. More were shipped out in the fall of 2013, including to several western Michigan waters for the first time. Fall fingerling muskellunge were stocked in Lake Macatawa, Mona Lake, Muskegon Lake, and on the Lower Grand River in Lloyd’s and Bruce bayous and Indian Channel. A 12 inch Great Lakes Musky. DNR personnel drained the ponds and collected and about 25,000 muskies, some in excess of 12 inches, which were transported to some 17 sites across the state. Among those sites were Thornapple and Big Bear lakes, which will be stocked annually for 10 years in an attempt to create new brood stock lake. Photo: Dave Kenyon, MDNR. Mona Lake got 1,043 fall fingerlings and will continue to get the same in future years. Other western Michigan waters got only a percentage of the desired stocking goal. Muskegon Lake got 6,846 fall fingerlings. The goal is eventually to stock 12,696. Each lower Grand River site got 1,100 fingerlings. The goal is to stock 1,500. Muskie stocking today is limited by production at Wolf Lake State Fish Hatchery in Mattawan, where space for the program is limited. Wesley and others hope that will grow in future years. “We’ve had to convert an old laboratory into a rearing facility there and have had some challenges with disease and other stuff,” Wesley said. “Last year was our best year so far. We raised and shipped 45,000 fall fingerlings. Raising muskies can be a challenge, according to Wesley. There is a learning curve even for experienced hatchery personnel. The hatchery took delivery of 1.2 million muskie eggs, collected from spawning fish on the Detroit River and Lake St, Clair where Great Lakes muskies thrive. Those eggs produced a half-million fry. At a certain point in a muskie’s young life they start to eat minnows. If none, or too few are available, they will eat each other. It’s taken a couple of years to learn and fine tune the feeding program. The hatchery suffered nearly an 80 percent loss in the meantime, Wesley said. Ramping up the program is likely to require a new or expanded facility. DNR staff have discussed and requested a coolwater rearing facility, one that would be geared towards species like muskie, walleye, lake sturgeon and northern pike. But getting there is likely to cost $3.5 million. In the meantime plans are underway to grow the program as best possible, which includes attempting over the next decade to convert Thornapple Lake, in eastern Barry County, into a broodstock lake for Great Lakes Muskies, saving the time and effort of needing to collect eggs from the Detroit area. It has been a western Michigan bloodstock lake for northern muskies. A similar conversion is also planned for Big Bear Lake in eastern Otsego County, according to Tim Cwalinski, a senior fish biologist from the DNR’s Northern Lake Huron Management Unit. “It’s been stocked (with Great Lakes muskies) for two or three years now and we hope in 10 years to be able to go into it for eggs for the program rather than down to the Detroit River,” Cwalinski said. 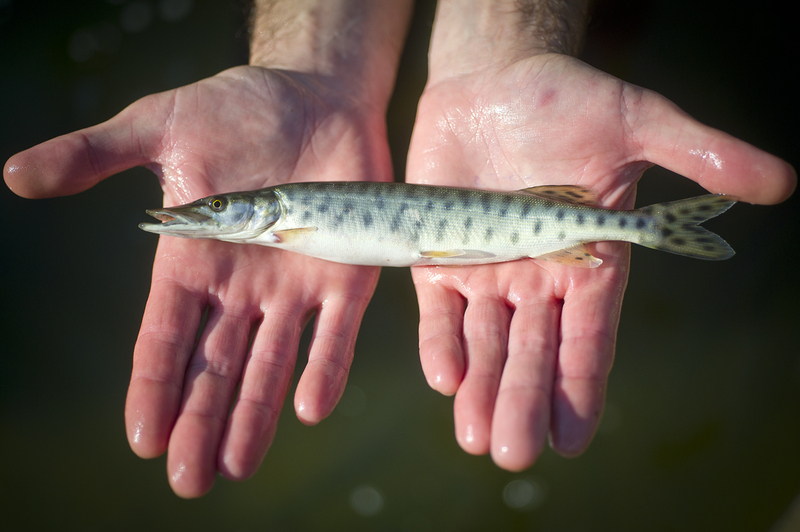 Four other northern waters got stocked with Great Lakes muskies last fall for the first time. Some had been stocked with northern muskies previously. Stocking practices have been erratic in the past. The plan now is to stock them consistently. Those waters include Lake Besser and Lake Winyah, two impoundments on the Thunder Bay River upstream from Alpena. Lake Winyah got 2,295 fall fingerlings last November and Lake Besser got 588 fall fingerlings. Otsego Lake, in Otsego County, got 2,978 fall fingerlings. It had been stocked with northern muskies in the past. Cooke Pond on the AuSable River got 2,913 fall fingerlings. Big Bear Lake got 1,800 fall fingerlings in November, the same as in in 2012. It got 3,046 in 2011. The conversion to Great Lakes muskellunge and the expansion of waters that have them is likely to spark additional interest in fishing in Michigan. That is good for the state and the economy. It could well draw anglers in from other areas. No doubt, it will be several years before they are abundant in the catch. But if Lake St. Clair’s Great Lakes muskie fishery is any indication of what is possible, that’s something well worth waiting for. This entry was posted in Uncategorized and tagged Conservation, DNR, Fish, Fishing, Great Lakes, Great Lakes Muskellunge, Michigan Department of Natural Resources, Muskellunge, Muskies, Nature. Bookmark the permalink. The educated sport fishers (public and charter) I’ve talked with are giving high fives and many thanks to the DNR & MMA for making the GLS musky stocking to the drowned river mouths a reality. The very few negative comments are coming from the old uneducated mindset “The musky will eat everything in the lake”. The non fishing public are happy to see the GLS musky as a potential control for some of the future Asian carp.